At the heart of the “Occupy Wall Street” movement and the general resistance to capitalist structural adjustment and austerity measures globally is the desire among activists to bring into question many aspects of not just corporate greed, fraudulently foreclosed homes, inequality, imperialism, political corruption, and unemployment, but a genuine desire to create more serious discourse about the very social and economic system that, up until now, so many people have taken for granted and accepted as something as natural as the air we breathe. In 2011 many people are beginning to see for themselves that capitalism is indeed not as natural and eternal as the champions of the status quo like to make them think. And as their pensions dwindle, their debts accumulate, their jobs vaporize, and their wages are further repressed in order to restore profits for big business and “liquidity” in the global markets, they are beginning to see that capitalism is not as beneficial for them or for society as a whole, especially when recklessness is rewarded and avarice is celebrated. People are also beginning to understand more that the traditional political parties, both Democrats and Republicans alike, provide no real alternatives to the problems that the majority of working people are faced with. In fact, the feeble solutions offered do nothing that will qualitatively alter the conditions that created the crisis in the first place. 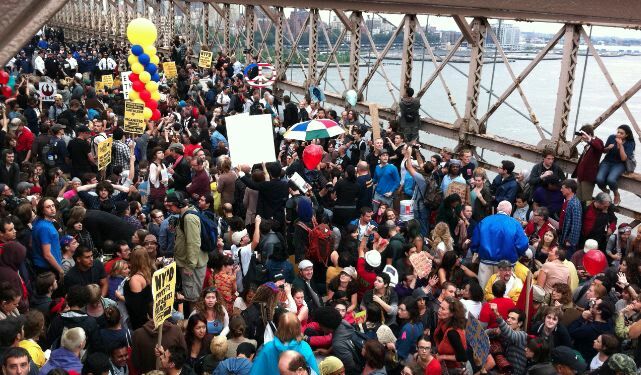 Just to quickly illustrate how perverse the situation is, it should be known that not one architect of the global meltdown has been charged or jailed for any of their criminal behavior in defrauding homeowners, destroying retirements, waging war and then making billions of of it, etc., but somehow 700 peaceful protesters were arrested for walking on a bridge! The anti-Wall Street atmosphere is brimming with inquisitive and passionate people that are asking many questions about the fundamental operation of the capitalist mode of production as a whole. A lot of young people are beginning to question if the system we have is indeed sustainable or even worth keeping around much longer. For example, we are told incessantly by cheerleaders of the capitalist system that in order to bring the US, and naturally, Western Europe, out of recession and for profits to be restored to business that the economy must expand at 3% per annum. This means that GDP has to be on the continual rise day after day, year after year,which also means that in order for that to happen more markets have to be exploited, more resources have to be extracted, and America’s twisted consumer culture has to keep growing. This seems paradoxical for a society that is vowing to implement meaningful reforms or to be more “sustainable.” Can you see the ridiculousness of it all? Capitalism cannot expand at a compound rate forever! There is only one Earth and that one Earth only has so many resources to exploit and extract. Another issue that many activists are beginning to discuss deals with the fact that in order for society to truly be a democracy and for resources to be distributed more equitably there has to first and foremost be democracy in the work place. We hear political figures speak about having a free and open democratic society all the time, but how democratic can any society be when most people that work 40-50 hrs a week enter into definite relations of production in the workplace that are anything but democratic! The workplace is the perfect example of a tyranny. The boss is the tyrant while the worker is forced to accept any and every decision that is made from the top tier down. How is that democracy? Democracy in society can only express itself as a democratic principle when it correlates to democracy in the places of employment. If the 99% of people that are represented as those that are not corporate CEOs, bankers, and entrenched politicians had more say in the decisions and the distribution of the surplus that is created in the workplace then we would begin to see a more equitable society and social order emerge. Democracy in its evolved form will manifest itself in a workplace that is run by those that actually work there! These are just a few of the many questions that the 99% should be addressing about capitalism in its current, extremely unequal and exploitative form. The crisis evolved not out of thin air, but out of specific historical conditions that have hitherto coalesced into a crisis of epidemic proportions, and it is our responsibility to ask questions and search for answers that are truly historic. Capitalism is only the “end of history” for those that feel there is no more history to create; no more justice to be brought about, and no progression and dignity for the human condition to fulfill.